Dale was born on April 8 1924 in Morland Grah, Kansas to parents Carles C. Maupin and Essie Lidia White. He was the second oldest of eight children. By the 1940 US census, he had completed one year of high school. He is recorded to have enlisted in August 21, 1943. Dale had the distinction of being the youngest member of the crew. Maupin was a POW and likely followed the same path as recorded for Giesler until the end of the war. 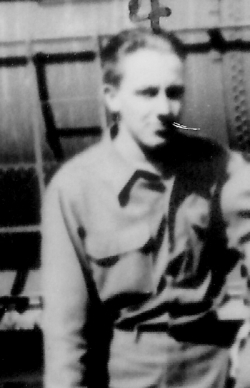 Per Harold Giesler’s son, Duane: Most of the captured Allied flyers, (including Dad) were detained for interrogation at Dulag Luft near Oberursal. From there, they went to Dulag Luft at Wetzlar for about a week, while they were being processed and assigned to a permanent camp. Most of the Kassel Mission enlisted men went by train to Stalag Luft lV at Gross Tychow, Poland (including Dad) and most...of the officers went to Stalag Luft l at Barth, Germany. The prisoners at Stalag Luft IV (including Dad) were put on the road Feb. 6, 1945 and began a march (ahead of advancing Russians) that lasted 86 days and covered about 600 miles. Dad’s bunch walked Southwest all the way to Fallingbostel and then back Northeast to Lubeck, Germany, where they were liberated by the English on May 2, 1945. I believe the same is true about Maupin, Land, and Howe. Dale married Anna Lou Foxworthy on August 19, 1947, in Mt. Hope, Hempstead Co., Arkansas. They had one son. Dale died on January 16, 1994, in Tipton, Moniteau Co., Missouri, and was buried in the Green Grove Cemetery in Latham, Moniteau Co., Missouri. Anna died in 2008.